Click here to book your free initial consultation with me in my Brighton hypnotherapy practice. Get started on your route to becoming free from fear of public speaking. I have helped many people overcome their fears of public speaking in my Brighton Hypnotherapy practice. It is such a common problem. 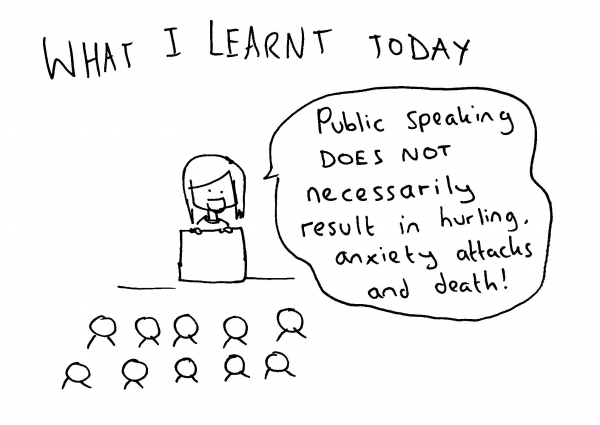 Anxiety with speaking or performing in public. It is said that this fear is more common than the fear of dying! There are so many benefits to overcoming the fear of public speaking here in Brighton. Some more obvious ones are being able to speak in front of a group clearly and without nervousness or embarrassment. This can help to get the message across better. Therefore it can help you to feel better about your performance. Feeling better about your performance can lead to more confidence in yourself. This can mean more opportunities opening up for you at work. It can mean other people have more confidence in you. They listen what you have to say. It can also mean that you can listen to what they have to say. You respond more quickly, intelligently and calmly. Book your free initial appointment now, or call me. Find out how I can help you, no matter how long you have had this issue. How deeply it seems to affect your performance. Having more confidence to speak up in public. This can mean that you have more confidence in other areas of your life as well. It can help with your social life, to know that you can speak up in a group and show of your charm and humour with no embarrassment. It is such a common problem but one that I have had many client’s find freedom from. Like a new way of feeling like their true selves, intelligent warm and funny. Even when speaking to a group or an audience. If you would like to find out more about how I can help you draw more easily on your confidence (no matter how deeply it seems to be buried) call me now or click here to book your initial free consultation in my Brighton Hypnotherapy practice, and start your journey towards freedom from fear of public speaking, and towards more natural confidence and ease in all situations. The work we did together was very helpful. I have been in many meetings over the last few months with colleagues and bouts of anxiety have lessened both in intensity and frequency. In my role I now go to meet with directors of different companies 3 to 4 times per week. I now enjoy these meetings as I can focus on the business at hand rather than on any potential for failure.